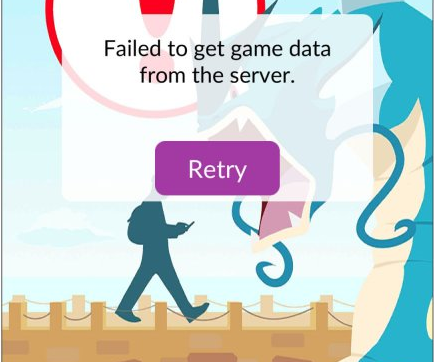 For a few days now, there’s been a lot of speculation behind the infamous and much dreaded “Failed to get game data from the server” error. Theories ranged from anything related to just server issues, to IP / device blacklists to the very worse one, namely a permanent ban. Purchasing boosting / farming / level up services. So far, the above mentioned actions are sure to get you a permanent ban, however, there have been reports of players getting banned for basically no reason, while playing Pokemon Go legitimately. Well, first of all, if you were using any cheats, there is a huge change you’ll get banned, so just so you know, be prepapred. Basically, at this point, there’s just one hint to know if you’ve been permanently banned, and that is the “Failed to get game data from the server” error upon trying to log into your Trainer’s account. If you see this image, then it’s pretty much a done deal, since there are no workarounds for it. Users have been trying to either delete the app’s cache, its data, restore the phone to factory settings, reinstall the app and such, but to no avail. The ban is issued from Niantic’s server, thus anything you do on your end will not have any impact on it. 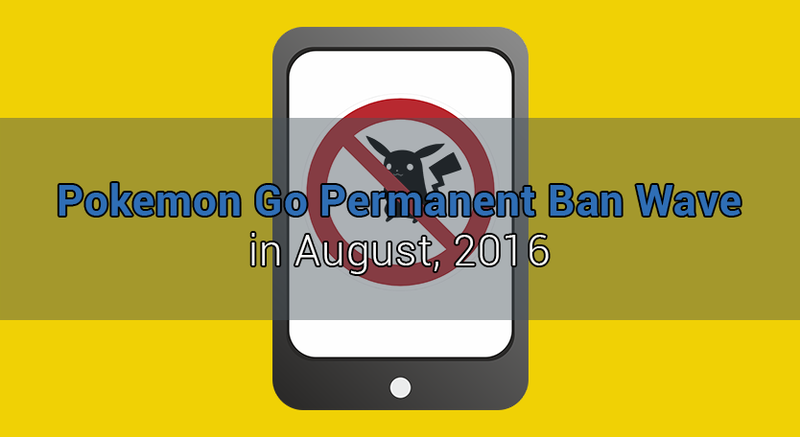 If you’re among the few lucky ones who managed to dodge the current Pokemon Go permanent ban wave, then you should really lay low for a while. We never encourage using third party software, however, if you have, this is the time to stop altogether. Ever since soft bans came, there have been reports that Niantic has been logging everything in preparation for a huge ban wave and for further game updates against cheats. With that in mind, chances of your account having been already flagged for being invloved in actions against the rules are quite big. Another useful tip is that while this is a ban wave, there’s no way of telling when or if it will stop. In other games, developers have been acquiring information for months before issuing a ban wave, and then sort of calmed down once all flagged accounts got hit. In Pokemon Go, it seems that people keep getting banned every day since it was first issued, so even if you are clean for weeks now, you can still get hit, as many other players have had that happen. Not use different IPs, especially proxies/VPNs, unless you’re in a different place physically and just don’t have other options than using a public WiFi or such. The idea is to avoid showing off either to players, which can get you reported and banned, or creating extra logs on your account to prove that cheats have been in fact used. Well, first of all, don’t panic, right? Cheating usually has a rule of thumb among the lines of “don’t cheat on an account you’re not prepared to lose”. In most games, it’s just a matter of time until that happens, and Pokemon Go is no different anymore. Since this is our area of expertise, we recommend you contacting us using this form for a free review of your case. However, if you’re not willing to purchase our services, you can submit a Ban Appeal yourself to Niantic, using this form and wait for their reply – note that this might drop your unbanning chances, in case you eventually want to hire us after appealing the ban yourself. In the meantime, we recommend you don’t create additional accounts, especially not on the same device / IP, but if you already are playing a different one, do not do anything that can get it banned as well. Niantic will be able to tell that it’s you (especially if you’re using the same setup of device ID, IP, etc. ), and chances are they won’t even consider your appeal. We also strongly recommend that you do not purchase a different account from someone else, regardless of their claims of not being botted on, at least until we hear some official word about these bans. Bottom line, we can’t really say we didn’t expect this to happen. While it is tragic that many players have been permanently banned for little mistakes, and some of them even while innocent, we must admit that especially botting and GPS spoofing did get out of hand quite a bit. The more Niantic has stood idle to the many reports against botters, the more legitimate players became frustrated, and they had to take action. Also, the fact that hundreds of players have been using bots to level hundreds of accounts at the same time with the sole purpose of selling them and make some money did not help one bit. Hopefully this post has helped you, and if you have any questions, problems or suggestions, please feel free to leave a comment and we’ll reply to it. We’ll also be editing this post should we find out anymore information, so make sure to keep an eye on it every now and then! I have played Pokemon go properly since was released. However recently (in the past 2 weeks) I have resorted to the use of GPS spoofing apps (I think this one is called Pokemon go ++) as I live in quite a rural part of England and the range of Pokemon within 10 miles of my house is extremely poor. I have not done anything extreme on the account in question other than spoofing to Santa Monica for a relatively short period of time. I believe it was the 9th of August when I learnt about the current ban wave and as a result I decided to stop spoofing on my main account. I should add that on the same account I previously used a service called ‘PokeAdvisor’ too check IVs, although this has since been shut down by Niantic and it’s users seeming went unpunished. Prior to me reading your article I created a second account and continued to spoof on that, however I have now completely deleted the spoofing app from my phone and intend to remain completely clean in the future. My question is whether of not you think I have any chance of keeping my account (it has not been banned yet although I’d say given recent events it is not unlikely to happen). I would also like to know if you have any advice if my account were to be banned. I would be willing to pay for your services if necessary, however me being only 16, I would be unable to pay online. If you haven’t been banned yet, there’s quite a decent chance you won’t get banned, but you’ll have to play legitimately as of now, at least until we hear an official word on what’s going on. If you do get banned though, contact us and we’ll see. I was under the impression that the current ban wave was only targeting botters rather than spoofers which led me to believe that my account had possibly been flagged for a future ban wave. However based on what you are saying I may have gotten away with it which is nice to hear. Thanks very much for your time, and I will be sure to contact you in the event that my account is taken down. Hello! We received your email too, but, unfortunately, we can’t reply because Verizon is blocking our SMTP IP. For the time being, you’ll have to use another email provider to get in touch with us (not web.de), or add us on Skype – Unbanster. Regarding your question, there’s always a chance to get your account back, but we can’t guarantee it. If you’ll purchase our services, we’ll definitely try our best. okay how do the services work? You’ll find everything you need to know here – https://unbanster.com/#process. You can also check our FAQ section. Regarding the prices and packages. We have 3 packages: “Lucky” offers only two tickets that we’ll write for you; “Hotshot” offers 10; and the last one, “VIP”, offers 20 letters and access to Skype support for VIP customers. For Pokemon Go, we recommend purchasing at least “Hotshot”. You can always upgrade to VIP, if necessary, by only paying the difference. You’re probably also wondering about your chances. We can never say what chances one can have exactly, regardless of the game, because every case is unique and depends on a lot of factors. Also, our Pokemon Go cases are still in progress, so nothing’s concluded until now. My account was permanently banned today but I haven’t botted or anything….. My son is extremely upset since all his hard work was for nothing….. Can someone help me? It’s hard to tell, however, they’re most likely looking at the speed you’re walking, GPS spoofing, number of actions per minute and the delay between them, altitude, accuracy of thrown Pokeballs, in-game uptime and some other features that distinguish a human player from a bot. Also, of course, device ID, IP and such as well. Hey guys, yesterday, I got the same message on my phone although, i dont think i have anything wrong…but after reading this article i have realised that me being in India had shared my acc with a friend of my Uncle who went to visit the US for official purpose(or actualy idk why he went there but he did do yeah)..and, therefore i had asked to play the game for me whenever he could. I had myself been grinding in India too. But, as you would know, Santa Monica, SF and the States in general have some good places to play Go and consequently, i had asked him to play in all those places possible. IS IT REALLY POSSIBLE THAT I HAVE BEEN BANNED ? AND, IF I FILL IN THEIR APPEAL, WHAT ARE THE CHANCES THAT I CAN GET IT BACK AND WHAT WOULD BE THE EXPECTED TIME EXPECTED TIME ?ALSO, WHAT I SHOULD MENTION IN THE APPEAL AS A PROOF ? Is it permanent ban on my device? And will I ever get my account back? If you get the “Failed to get game data from the server”, then yes, unfortunately it’s a permanent ban. You can’t do anything about it other than sending an appeal to Niantic. Your device, however, might not be banned nor blacklisted, so if you start a different account from scratch, you should be fine, assuming that none of your actions are against the game’s terms of service. Have any banned accounts been restored yet? No case has been concluded yet, because of the number of tickets sent every day. Niantic takes quite some time to reply to appeals. There’s a ban wave today. I stopped botting 5 days ago, legitimately climbed up to 24 from 23 in 2 days but unfortunately, previous history of botting has been caught and now banned. legit from lvl1-9, aug8-14, then bot’d from aug15-18 (lvl9-23). Then legit from 23-24 and went a quarter of the way yesterday. Don’t do it guys. no matter how small the crime, or how careful you are, from the moment you do login from an unofficial source, your account will be flagged then it’s only a matter of time. I thank Niantic for banning me on 24, because I was testing if I can go up to 26 and not get banned, that would have been a ton of time wasted just to get banned in the end. Sorry to hear you got banned. :/ And yes, they flag accounts regardless of when the bot was used and how, and sooner or later they’ll issue bans for pretty much every single flagged account they have, so it’s just a matter of time. So i’ve gotten 4 soft bans now and GPS spoofed for only 2 days before stopping completely after hearing about the permabans. I’ve also disconnected pokemon go to my email account just to be on the safe side. Is a permaban based on how many soft bans you get or do they just flag all accounts that have previously gotten soft banned? Should I expect a permaban soon? What happens if I have a friend of scared being banned but spoofs the gps but he walks in his own city only. Will he still get banned? They won’t reply to you within seconds of posting the comment you know. It doesn’t help that you spam badly written questions in many seperate comments. The simple answer is if you cheat on an account, regardless whether it is you, your friend or your brother, Niantic does not care and will flag your account. Do not cheat on an account you aren’t prepared to lose. Sorry, I am stealing your thunder haha :). It’s just that Pokemon go account bans are something that I have researched quite heavily and fortunately I seem to have gotten away with my slightly risky choice of ways to play the game. Just for everyone’s information, Niantic released a statement saying that they would be reversing a small portion of permanent bans. Particularly on the accounts of users who had been used by various tracker sites to scrape information from the servers. Also the vast majority of the aggressive banning seems to be aimed at bots rather than spoofers, however they say that should these players break the rules again, there accounts really will be terminated. Apologies if my previous reply seemed a bit blunt, if it had that effect, it was not intentional :).